A two person team created the most downloaded and sophisticated campaign app of 2016. Here’s how our new tech helped Ted Cruz achieve an historic victory in Iowa, and how it can help other conservative candidates and causes win elections. In the days since the Iowa caucuses, “Team Cruz” has rightfully taken credit for their ground game, organization and savvy use of big data and tech. 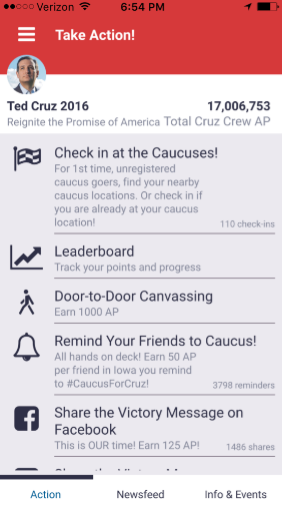 The Cruz Crew app in particular, has been praised for being “arguably the most sophisticated app deployed by the current field of presidential candidates” (TechRepublic), it is “slickly designed” (Gizmodo) and “tap[s] into the trove of voter information that helps build the databases and voter models that drive modern campaigns” (NPR). 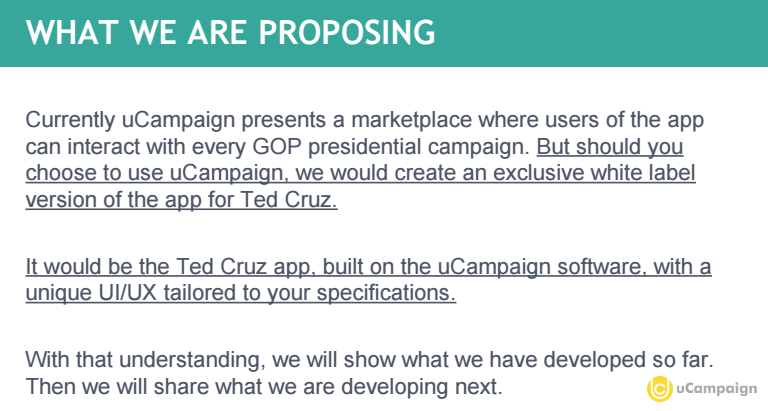 But less well known is this fact: Team Cruz completely outsourced their app to our stealth startup. This is the story of how we at uCampaign built the most innovative political app of 2016. These messages did not come from the Cruz campaign, or an aligned SuperPAC, 501c4, robocall, mailer or phonebank. All of these more traditional methods can be ignored. 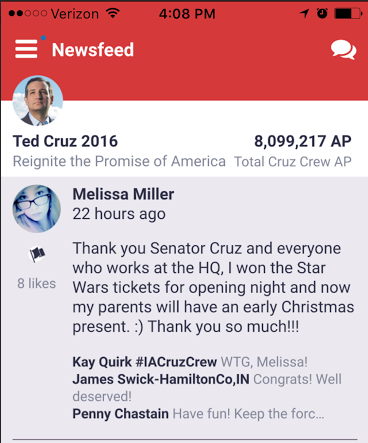 Instead, these targeted messages were sent by friends who use the official Ted Cruz app we designed. And that kind of message gets read, because it is much harder to ignore your friends when they text you. 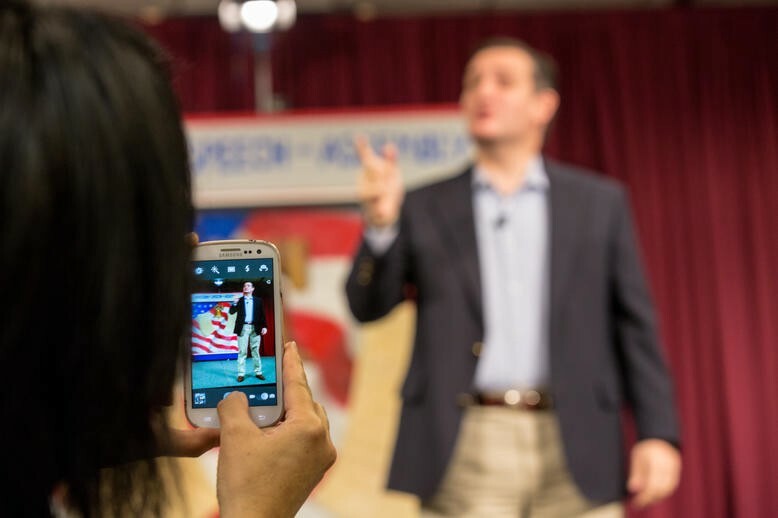 The apps we build such as Ted Cruz 2016 make it as easy as possible for supporters to engage in digital grassroots activities like the peer persuasion example above. Since launching last summer, Ted Cruz supporters have taken over half a million individual actions through the app we built, including sending over 230,000 personal invitations, making more than 16,000 individual donations and sharing over 100,000 campaign messages to Facebook and Twitter (see the infographic for more details). uCampaign delivered these results and more for about 1/8th the cost of what Donald Trump’s campaign spent on hats during the same period. In an age when SuperPACs like Right to Rise spent $64.8 million nationwide (roughly $25,000 per Iowa vote), we suggest spending what it costs to turn out two or three possible voters at that rate on a new tech that taps into the real, personal network of a campaign’s actual supporters. The idea for uCampaign began on the evening of November 6, 2012, as President Obama’s superb digital operation and grassroots mobilization combined to defeat Republicans for a second time in a row. I became convinced that night the only way to defeat Democrats was to learn from their tech advances, and then leapfrog them. The biggest obstacle was bridging the gap between digital and field. It took over two years to read up and plan, but eventually I found backing and a (really, really good) developer, and we got to work. Our goal was to create a new tool that would connect digital and field for a low cost, with measurable results. We began with the supposition that effective digital grassroots activism should be mobile, social and sticky (=easy to use, hard to discard). So we decided on a smartphone app, because these apps are not just mobile-first, they are mobile-native: users can act any time and from anywhere, and (with their permission) we gain access to the most valuable digital space a supporter has, including their notifications tray. We made it social by including user profiles, an interactive newsfeed, localization features, and user-generated content. And we made it sticky by offering gamification, points, badges, trivia, public recognition for top activists and real-world prizes (bumper stickers and t-shirts FTW). We put all of this together in an iPhone prototype and a simple pitch deck to approach 2016 GOP presidential candidates. Sure, it was a long-shot, going for the top of the ticket, when we, er, had no paying clients or case studies at that point. But Chris Wilson, director of Cruz’s polling and analytics department, and mastermind of the Cruz big data push, saw the potential in the early product. On May 29th, we began developing the Cruz Crew app on iOS and Android, and three weeks later we were live in both app stores. We soft launched it with Cruz’s national grassroots leaders on July 22nd, and the Cruz campaign introduced it to their general supporters on August 4th. Team Cruz chose uCampaign because it would help them put existing data to use and generate new data. As a phone app it has authorized access to a supporter’s phone address book contacts. That allows it to match those contacts to Cruz’s voter universes and prompt existing supporters to reach out personally to identified potential supporters. To date the feature has matched over a third of a million potential supporters who are contacts of one or more of the app’s current supporters. The second source of data are self, individual friend and neighborhood surveys. App supporters have completed over 20,000 political ID surveys about themselves, their friends and their neighbors, generating valuable cross-section data on the supporters’ political views, activism affinities and personal network, essential information for a modern, data-driven campaign. The third source of data is everything the app supporters do through the app and volunteer about themselves: email, phone, location, age range, gender, social IDs, and, importantly, what calls to action they prefer and avoid. The app offers instant access to a campaign’s most committed supporters in a space they constantly inhabit. Does this sound like more engagement than what a campaign website offers? Over the months that followed the August launch, we planned, developed, tested, retested, deployed and repeated at a breakneck pace. 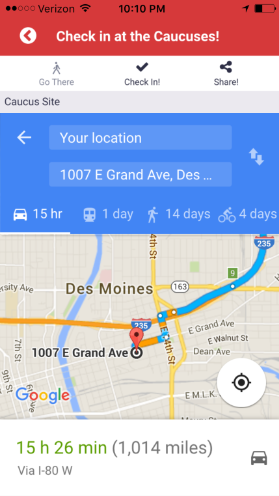 Along the way to Iowa, a funny thing happened: community. 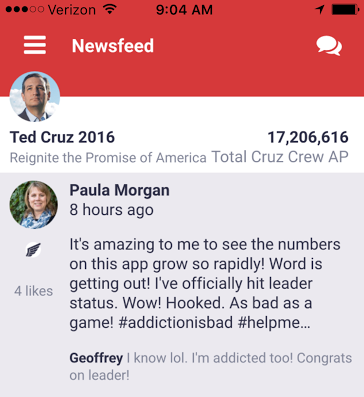 Unlike the awkward conversations with uncles and cousins on a Facebook newsfeed, or the perpetual drama of political Twitter, these apps offer a safe space for like-minded supporters of Ted Cruz to interact via the in-app newsfeed. … where she received encouragement and good vibes from other app supporters. All of this interaction happens spontaneously without the prompting of Cruz staff. The app just created the sandbox. This community happens naturally and organically. And it’s yet another reason the app succeeds in its mission. By the time the 72 hour pre-caucus window was upon us, uCampaign was firing on all cylinders. In addition to having sent over 230,000 invitations, app supporters were posting Cruz GOTV messages to their Facebook and Twitter, sharing a “How to Caucus for Cruz” video from YouTube, sending GOTV reminders to their friends in Iowa, filling out political ID surveys, going door-to-door, rallying themselves on the app newsfeed, and navigating to their caucus locations using their GPS. In the final 24 hours the app served over 850,000 requests to the 11,000 supporters who were online, pulling 2GB of data through the system. Ted Cruz’s final margin of victory in Iowa was a bit over 6,000 votes. In the 72 hours after Iowa, the app’s supporter base grew by almost 10%, over 1,600 new donations were made, almost 6,000 new invitations sent, and over 8,500 new actions taken. The march to New Hampshire had already begun. We are now learning from our first caucus day experience — our first victory — and applying these lessons to improve the product for when New Hampshire votes in four days. We are currently building custom apps for advocacy groups like Missouri Alliance for Freedom and Firearms Policy Council. We have our sights on ballot initiatives, U.S. House races, and smaller local campaigns through custom apps as well as our universal app. No matter how large or how small your outfit, as long as your candidate or group has supporters and a good mission, uCampaign has a solution to turn your supporters into effective activists. We are ready to start building the next winning app today.